Ask anyone about Aly, and they’ll tell you she’s into tech stuff and Jewish stuff. After starting the account @jewishgirlprobs on Instagram, Aly realized she found a way to combine both her technological skills and her passion for Judaism and its teachings. The account posts memes, photos, and jokes, all centred on relatable Jewish content. But, Jewish Girl Probs brings more than just a fleeting laugh or smile to its followers. It speaks to the communal aspect of Judaism and brings thousands of people with similar backgrounds together through an online platform. Aly hopes to grow Jewish Girl Probs in order to reach more people and provide them with a daily dose of Judaism. More deeply, Aly wants the account to bring light to Jewish issues and help the broader Jewish community. Some see social media as dangerous and addictive, but Aly is committed to using it to touch as many lives as possible and make a real-life impact away from the screen. “Social media can be extremely beneficial if used for the right reasons in the right way.” She continues to grow her account and looks forward to its further development. Aly Silverberg grew up in Thornhill and became involved with her synagogue and Jewish youth movements. She has always been tech savvy and found her passions for technology and Jewish spaces colliding in leadership positions she took on. She started Jewish Girl Probs three months ago and it has over 2000 followers with a steady growth rate. 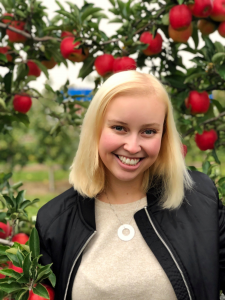 She is studying Media Information and Technoculture at Western and hopes to continue to combine her passions in a meaningful and fulfilling career.